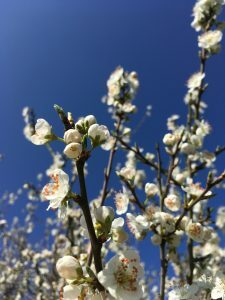 Beautiful blue skies above this sloe tree blossom along the banks of the canal and through the vale of Pewsey. Spring has sprung and the hedgerows along the towpath are coming back to life to welcome our holidaymakers cruising past on our White Horse Narrow Boats. As you relax and slow down you may like to read some of the poetry that has been written about canal. The Poet Laureate Jo Bell wrote this about Springtime in the boatyard. Our boats have had their annual makeover and are now ‘on holiday’ with their crews just enjoying the canal. Jo Bell, the Canal & River Trust and Poetry Society’s first Canal Laureate.